The adjusted closing price of BP on May 4, 2010 was $51.20 whereas had the oil spill not happened I’ve estimated the price would have been $58.11. This amounts to a net loss of $6.91 per share. BP has 3.13 billion shares outstanding amounting to a net loss in $21.62 billion. BP, in agreement with the US government, set up a $20-billion trust to provide confidence that funds would be available. The trust fund was established to satisfy claims adjudicated by the Gulf Coast Claims Facility (GCCF), final judgments in litigation and litigation settlements, state and local response costs and claims, and natural resource damages and related costs. In 2011, BP contributed a total of $10.1 billion to the fund, including our second year commitment of $5 billion to the trust and the cash settlements received from MOEX USA Corporation (MOEX), Weatherford US., LP (Weatherford), and Anadarko Petroleum Company (Anadarko). This brings the total amount contributed to the trust to $15.1 billion. The remaining committed contributions totalling $4.9 billion are scheduled to be made in 2012 which includes the $250 million settlement with Cameron. The trust disbursed $3.7 billion in 2011 and the total paid out since its establishment amounted to $6.7 billion by the end of 2011. In Econ 100 this week we talked about external costs (and benefits) and the equivalence of carrots (prices) and quantities (sticks) in terms of the possible “optimal” equilibrium outcomes. The elephant in the room in these types of discussions is the measurement of the so-called external costs. As if on cue, environmental economics superstar and sometime Presidential advisor Michael Greenstone and his co-author Michael Looney have upped a paper with their estimates of these costs associated with electricity and energy. The glaring purple associated with coal shows that the principal external costs are not from greenhouse gases, but from conventional criteria pollutants (e.g., NOx, PM). 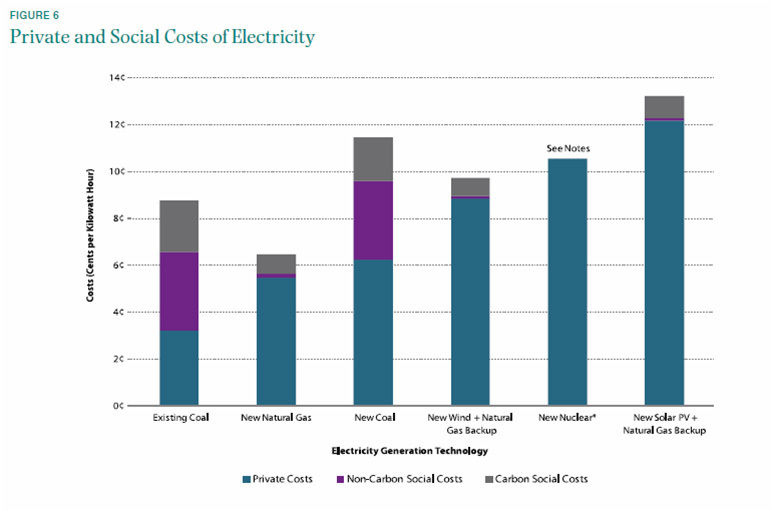 The external costs of coal, even new “clean coal,” are estimated to be higher than the actual operating costs. Yikes. It’s worth noting that both solar and wind have non-trivial carbon footprints, because the variability of supply requires ample natural gas plants to cover supply on days when the wind doesn’t blow and the sun doesn’t shine. Certainly, developing battery storage technologies may well turn out to be the biggest environmental challenge of this next half century. “It is not a good policy to have these massive subsidies for first-generation ethanol,” Gore said at a green energy conference in Athens, Greece, according to Reuters. First generation refers to the most basic, energy-intensive process of converting corn to ethanol for use as a motor vehicle fuel additive. If Hahn and Cecot’s benefit-cost analysis didn’t convince you, perhaps this bit of visual evidence will be persuasive (c/o Knowledge Problem). The first map is the votes on an amendment to an appropriations bill proposal to prevent EPA from encouraging sale of gasoline with higher ethanol content. The red represents votes opposing the amendment (pro-ethanol) and the blue represents the votes for the amendment. The Knowledge Problem piece also points us to where the ethanol production comes from. My “ocular” regression seems to indicate a rather robust relationship between the production and the votes. For more political geography, check out this post on climate legislation. And if you think the politics is predictable, try out the economics. What happens when the demand for corn ethanol increases? One would suspect the price of corn increases, leading to more corn and a reduction in the supply of, say, soybeans. As I sift through material for my environmental economics course (Econ 280) this winter, I have found some very interesting material on the political economy of climate change. Ryan Liazza in the New Yorker walks through the process by which an idea becomes a bill becomes a law — or, in this case, doesn’t become a law. It is difficult to understand environmental economics and policy without knowledge of these tortured dealings, the underlying institutional rules, and that pesky electorate. Over at the Economix blog, David Leonhardt has been doing yeoman’s work, provides another perspective on the political economics of climate change legislation, looks at what EPA could reasonably do to curb CO2 emission without such enabling legislation, and has a couple of pieces (one here, one here) on so-called clean energy. I will also use this paper on “carbon geography” to illustrate how economists go about these political economics questions. I don’t think we as economists ever expected serious climate legislation, certainly nothing approaching the types of reductions needed to stabilize atmospheric concentrations. As far as I know, the climate is still changing, so nothing to update there. According to economists Matthew Kahn and Matthew Kotchen, however, we don’t seem to care as much about it (if “googling” is a good proxy for “caring”, that is). Ed Glaeser discusses this and some more of Kahn’s research in today’s NYT Economix blog post. One of the provocative points is the claim that climate change is a done deal, and that the big coming challenge is to adapt. One person swimming against the apathy tide is the self-proclaimed skeptical environmentalist, Bjørn Lomborg. 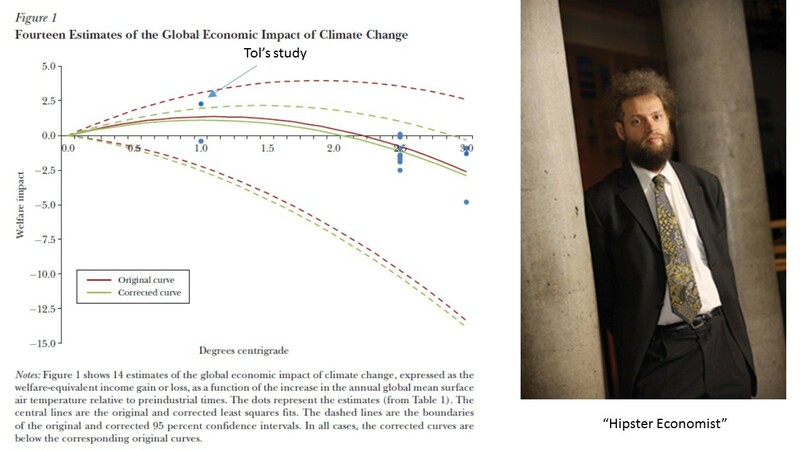 For years, Lomborg has been publishing pieces questioning the scale and scope of environmental problems. He has now reversed course and is calling for massive investments to tackle the problem. From my quick read, the tackling seems to be on the emissions side, as opposed to adaptation. Anyone who has sat through my carbon capture and sequestration talk certainly knows I’m with the adaptation folks on this one. I simply am not convinced that the world can cut emissions enough to stabilize atmospheric concentrations, even under the most wildly-optimistic scenarios. For a bit more meat on the climate change discussion, check out a recent symposium in the Journal of Economic Perspectives. Here’s a table of estimated net benefits across 13 studies. 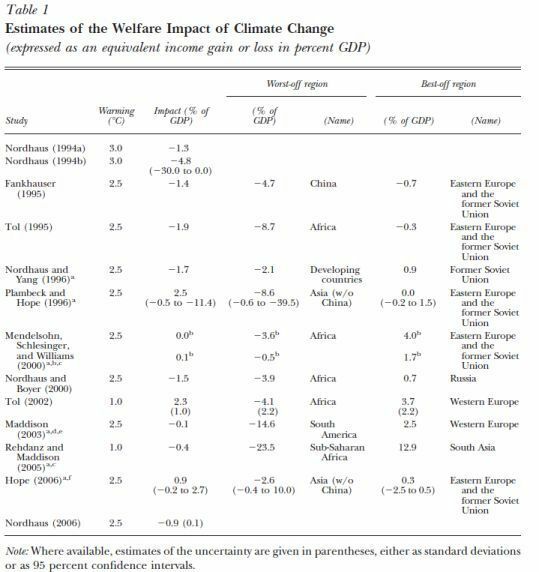 Notice the overall impacts in terms of GDP per year seem to be on the order of -1% per year, though the estimate from the review author’s article (Richard Tol) shows net gains. You might also take note as to which countries are likely to win and lose in these estimates, and take that into account next time countries sit down to hammer out an agreement. Should be an interesting century. If there is any upside to the epic oil spill down in the Gulf (and heading this way), it is that it provided a learning opportunity for my courses in Political Economy of Regulation (Econ 240) and Environmental Economics (Econ 280). I’ll start with the benefit-cost analysis (I actually started this yesterday and have touched on it here and here), and I will try to get to the regulations next week. The Environmental Economics class looked at the benefit-cost analysis of offshore drilling described in the Draft Proposed Outer Continental Shelf (OCS) Oil and Gas Leasing Program 2010–2015. The document covered areas in Alaska, California, and the Gulf. The students looked at the benefits and costs of expanding offshore production, including the quantification of the environmental (external) costs. The results deviated little from the extant program from 2007-2012 (see table), where the quantified benefits were far higher than production and external costs. Most of the benefits manifest themselves in the difference between oil and gas prices and the production costs (net economic value in the table). The producers take a chunk of profit and the federal government takes a 12.5% gross production royalty that it redistributes to the states. The net benefits calculation is the consumer surplus and producer profits less the environmental costs. As can be seen in the table, the values are dominated by producer profits (roughly equivalent to “net economic value”). The analysis assumes $46/b oil prices, $7 / McF natural gas prices, and a 7% real discount rate. Q: How do we regulate in the face of rapid, complex technological innovation? Use back of page to answer if necessary. The question for today is what do the recent spill and the financial crash have in common? Kenneth Rogoff has an opinion piece about the difficulty of regulation amid rapid technological advance. The parallels between the oil spill and the recent financial crisis are all too painful: the promise of innovation, unfathomable complexity, and lack of transparency… Wealthy and politically powerful lobbies put enormous pressure on even the most robust governance structures. And it doesn’t stop there at all. The basic problem of complexity, technology, and regulation extends to many other areas of modern life. Nanotechnology and innovation in developing artificial organisms offer a huge potential boon to mankind, promising development of new materials, medicines, and treatment techniques. Yet, with all of these exciting technologies, it is extremely difficult to strike a balance between managing “tail risk” – a very small risk of a very large disaster – and supporting innovation. So in a world of rapid technological advance, what is the role in public policy in capturing the benefits while also mitigating the risks? Is “the market” best left to its own devices? Certainly, we have addressed this question in other forms. I don’t have any answers, and you aren’t likely to find any either. But the point of a lot of what we do on Briggs 2nd is to try to frame and analyze problems, understand what the issues are, the potential winners and losers, and have a discussion about how to proceed. I hope this helps. He is also the author of This Time Is Different: Eight Centuries of Financial Folly. You can find a paper version here and the book here. BP’s stock, which traded at a 52-week high of $62.38 on Jan. 19, 2010, closed on June 1 at $36.52 a share, down 15% on the day. The post-spill sell-off has wiped out some $68 billion of BP’s market value, knocking it down to $114 billion. With the stock now in the cellar, some speculation even has it that BP may attract a buyer. First, the stock price reflects the value that “the market” places on a company. One technique for evaluating the effect of some major event on a company’s value is to do an “event study.” The idea is to try to use other factors (e.g., larger market trends, stock prices of other firms in the industry) to get at how important the event was. A spill like this could damage a company’s reputation, expose it to liability payouts, or make it susceptible to heavy fines. Ben Fissel at Econbrowser put one of these together shortly after the spill. When an event, such as this oil spill, impacts a company it will also impact its long run profitability. The divergence of the stock price from what we would have expected had the event never happened is a measure of the net present value of the cost incurred by the oil spill. He finds big impacts. The red line in the picture is his estimate of the time series of BP’s stock price without the spill, and the black line is the actual price. Seems like a big effect. At the time he did the study, the stock price had been between $50 and $60 for the previous three months. As the AOL article shows, the price is now down closer to $35. Overall, the market’s valuation of BP has gone from more than $180 billion to about $114 billion. Does that seem reasonable? That is, in fact, the second point, that doesn’t seem all that reasonable, which is why BP’s stock is now so low that it might be attracting a buyer. In other words, at current prices smart money might find BP stock such a bargain that it will swoop in and buy the company, liability exposure be damned. Does that seem reasonable? I completely buy this logic. Given that BP is the world’s largest oil producer, it is hard to believe that the long-term profitability of the company has really fallen 40% due to the oil spill. The linked article provides some reasons why a merger might be implausible, but on the fundamentals, this may well be an overreaction. Further food for thought, what will happen to oil prices if there are significant steps taken to reduce offshore drilling and who stands to win and lose from those price changes?